Dr. Austin is a recognized expert on how to consider the issue of past domestic and intimate partner violence (IPV) in the context of a parenting evaluation. He has created two forensic models for custody evaluators to use in assessing IPV in a custody case (Austin, 2000; 2001) that listed below. 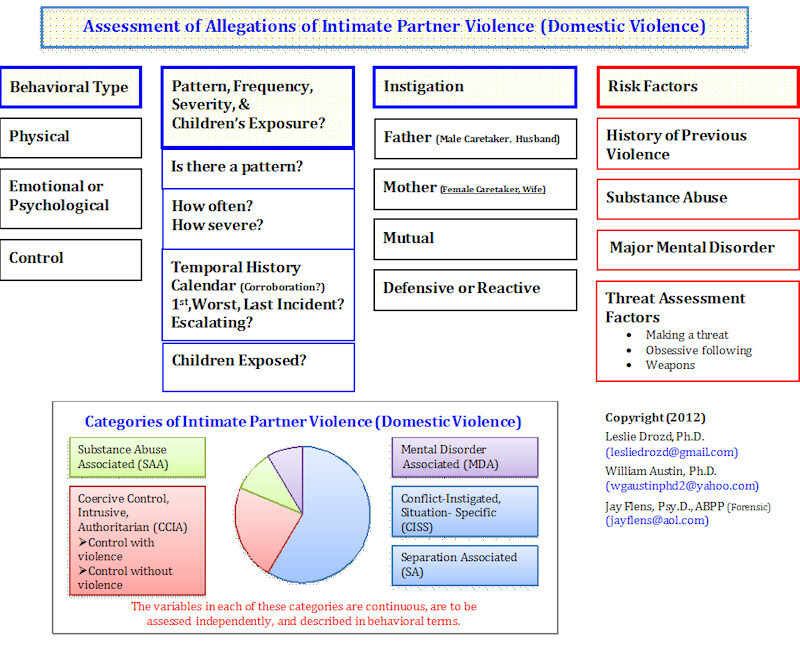 The first model (2000) presents a framework for the assessment allegations of IPV that are asserted in a custody dispute. It presents 6 factors to consider and stresses the need for careful investigation with openness to alternative hypotheses on the issue. The second model (2001) presents a predictive typology of IPV as a tool for evaluators to describe the relevant behavioral dimensions and a violence risk assessment approach. The models assist evaluators in their role to address IPV risk and safety issues when past violence is alleged. The evaluator needs to show the court how past violence and the presence of risk factors is relevant to crafting the parenting plan and a safety plan or risk management strategy if one is needed. Dr. Austin is currently working on a new integrated forensic model (with Dr. Leslie Drozd and Dr. James Flens) that revises the current typology of IPV that has been introduced to the fields of child custody and domestic violence; emphasizes behavioral dimensions rather than types; and identifies major risk factors. The goals of the new model are to provide the court with clear descriptions of the subtype of IPV that is present; accurate predictions on future violence and parenting based on research; and accurate, specific, behavioral descriptions for the court. Workshops on this new model have been presented and are listed below. Austin, W. G. (2001). Partner Violence and Risk Assessment in Child Custody Evaluations. Family Court Review, 39, 483-496. This article was selected to appear in the book on Essays in the Family Court Review that is published conjointly by the Family Court Review and Hostra University School of Law. The Integrated Approach to the Assessment of Intimate Partner Violence in Child Custody Evaluation. Association of Family and Conciliation Courts, 48th Annual Conference, Research, Policy and Practice in Family Courts: What's Gender Got to do with it? Orlando, Florida, June 1-4, 2011 (with Leslie M. Drozd, Ph.D. & James R. Flens, Psy.D., ABPP). Integrated Approach to the assessment of intimate partner violence in child custody evaluation. Association of Family and Conciliation Courts, Ninth Symposium on Child Custody Evaluations, Cambridge, Mass, October 29, 2010 (with Leslie M. Drozd, Ph.D. & James R. Flens, Psy.D., ABPP). Intimate Partner Violence, High Conflict, and Crafting Safe and Effective Parenting Plans. Association of Family and Conciliation Courts, Regional Training Conference: Interventions for Family Conflict: Stacking the Odds in Favor of Children. Reno, NV, November 7, 2009 (with Leslie Drozd, Ph.D. & James R. Flens, Psy.D., ABPP). Partner Violence: Research, Subtypes, and Risk Assessment, with Jonathan W. Gould, Ph.D. Invited Workshop for Association of Family and Conciliation Courts, California Chapter, Annual Meetings, February 11, 2005, Sonoma, CA.